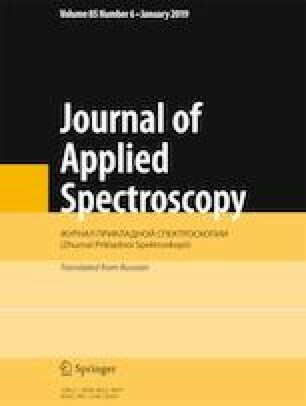 Raman scattering enhancement is shown using Au/SiGe and Au/Ge substrates obtained by chemical deposition of SiGe and Ge layers from the gas phase under reduced pressure on silicon substrates and the thermal deposition of gold. AFM image analysis showed cone-shaped nanorods formed on the surface of the substrates. These nanostructures permit us to obtain Raman scattering enhancement of mitoxanthrone (C = 10–5 M) of at least two or three orders of magnitude. Excitation at 785 nm gave additional enhancement of the SERS signal by a factor of 1.7–4.3 for the Au/Ge substrates and of 1.5–5.5 for the Au/SiGe substrates. Translated from Zhurnal Prikladnoi Spektroskopii, Vol. 86, No. 1, pp. 84–88, January–February, 2018.